Hoist the sails, crank the winches, everyone gets to steer, not crowded, 6 guests maximum. A USCG licensed skipper will be on board. 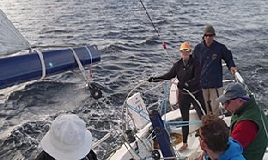  Go sailing - Upwind, downwind, reefing if required, set the spinnaker if weather permits. Approx 2 hours. 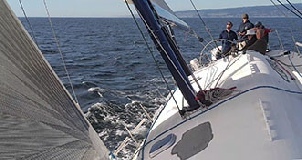  Back to the dock, de-brief and put the sails away. o Your foul weather gear. o Your lifejacket and tether. If you don’t have one, we can furnish. Email Bill Lee with any questions and your desired schedule dates . . . . . . .
Do you have any interesting pictures, links, stories, race results that might be fun to include on our site? Logged in as needed for scheduled calls.